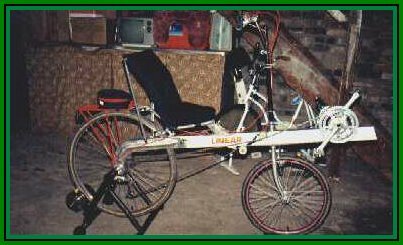 I acquired a Linear Sonic short wheel based (SWB) recumbent in Feb. of 99. 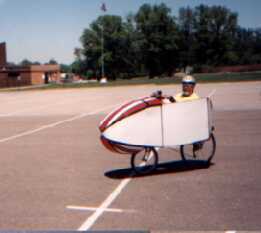 The main focus of this WebSite is the construction of the full fairing for the Sonic. 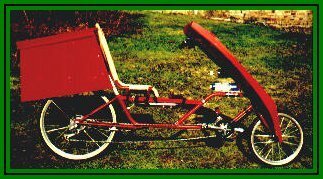 I got a great deal of help from The Chicagoland Recumbent Riders WebSite. Ed Gin a member of this club conducts seminars on how to build a fairing using coraplast. Coraplast is a lightweight plastic material that is corrugated like cardboard. It is very light and reasonably strong. Coraplast can be obtained at you are local plastic supplier, or sign shop. Campbell's sign shop in Calcutta Ohio is my local supplier. The price of coraplast varies so when you read Ed's supply list it is only an estimate of the price. The cheapest I can get coraplast for here is 15 dollars a four by eight sheet. For the people who wanted to get a better look at my derailleur post follow this link. 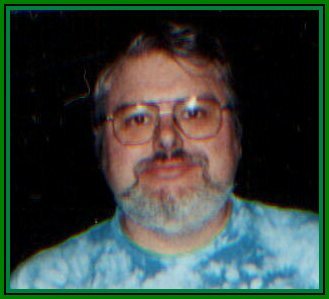 Sheldon Brown's WebSite is an excellent place to find information bicycles. It is also a mail-order bicycle shop.